Yesterday was a relax day. We never left the Hotel/RV Park. Puttered around, checked the tire pressure... had a nap... that kind of thing. We had been in need of a relax day, especially since today is a long travel day. We only have three more nights in Mexico! Today, we are driving to Saltillo for a two night stay, and then to Garcia Caverns for a night of Mexican boondocking before heading up to cross the border Saturday morning. It's been a great trip for us. Far better than last year's. Traveling with seven other RV's compared to eleven other RV's makes a big difference. Especially when there are no tow or towed vehicles and the rig size is limited. The longest rig we had was 30', and I think that if we do a trip again next year we will limit it to 30'. Unfortunately, that will eliminate a lot of interested people but it really makes for much more enjoyable traveling to some of the out of the way places that we like to go to. And, we made some great friends. It's always an interesting social experiment putting a relatively small group of strangers together for an extended period of time. Obviously, some will get along... and others not so much. It's pretty much a given. But on this particular trip we think we have met some lifelong friends. Introducing the group to the Mexico that we know instead of the tourist Mexico was very rewarding for us. They had the opportunity to meet with the locals... Chris and Juan in Montemorelos, Paco and Oti and the group at Valle de Bravo, our Mexican family in Puerto Escondido, Barb and Sal and all the gang at Valle de Juarez, Alejandra in Zacatecas... among others. And hopefully, we will have given them the confidence to return to Mexico on their own if they choose. Although, some of them are even talking about coming back with us again next year if we do another trip! After we cross the border on Saturday, we will buy another annual Texas State Parks Pass and wander around south Texas for two and a half weeks until we fly back to Ottawa on April 19th. At happy hour today, we ordered room service for the group! 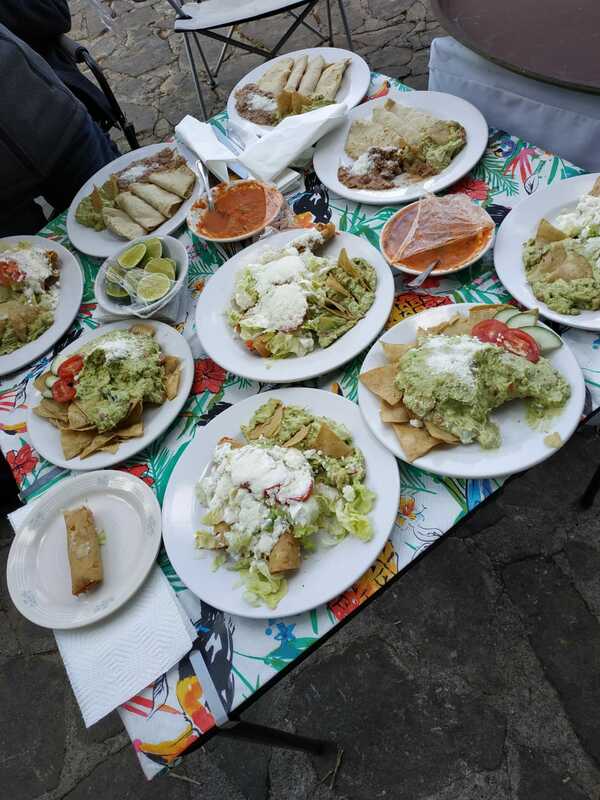 Quesadillas, flautas, and guacamole to snack on at happy hour! Anyhow... gotta get going to Saltillo... see you there! Record low price on the expensive Osprey Ozone Convertible Wheeled Luggage. Thanks for continuing to follow along with us. Are you parking the RV in Texas when you fly to Ottawa? Yes, we have a place to park Sherman just outside of Austin. He will stay in Texas for the summer. I really enjoy your writing, your photography, and your spirit of adventure. One idea would be at the conclusion of your caravans, do an post-itinerary with notes of recommendations such as would do again, would not do this again, do this instead, recommended time to do a stop, notes on closed or days closed, under construction. This might help you if you for future caravans and as a suggested guide to those who are DIY. Again, thanks for your posts. We are glad that you have enjoyed our posts from our winter travels with the caravan, along with our pictures. We really had a good time showing off Mexico. We will do a post conclusion but to put all the information that you are suggesting is a whole lot of work and things that we enjoyed or disliked might be different for different people because there are so many variables. We have kept notes that we can use to help in making the caravan trip even better if we do this again next winter but if we do, we will also be making the route different. As for things that are opened or closed along with construction areas, these things can change from one year to the next so it really wouldn't be helpful to us or someone else traveling in that area next year. If anyone has questions about any of the places we have visited they can sent us an email or check out our blog. The snack food looks like supper to me! How do you find these places to park your rv when gone. We have heard of people doing it through Craigslist but cant find the appropriate category. Your trip has been absolutely fantastic to follow. Thanks for the experience. Several different ways. A few years ago we left Sherman parked in someone's yard near the Las Vegas Airport for a month. We found that place by using Craigslist. This time around when we posted that we were flying back to Ottawa and then on to Calgary for our flight to Australia, one of our readers said that we were welcome to park Sherman for the summer on their property near Austin, so we took them up on the offer. Otherwise we would have checked out prices of storage places and also looked at Craigslist to find a secure spot and a good price. Wow, great happy hour! Yes, you guys really did Mexico well and your caravan guests probably saw things most visitors will never even know about. That went by so fast! I can see why they enjoyed it though, lots of neat places most people never get to, lots of good food, lots of good friends.